For over a century, The Pendennis Club Original Henry Bain’s Famous Sauce was only available to members and guests of the world renowned Pendennis Club in Louisville, Kentucky. After decades of incomparable enjoyment, the Club is pleased to share its signature sauce with the public. This fabulous sauce was the creation of the Club’s legendary Maître d’, Henry Bain (1863-1928), who was one of its first employees after the Club’s formation in 1881. He perfected this sauce to complement not only steaks but also local game animals. At this time it is fitting to remember and pay tribute to Henry Bain, the man. He was born on March 23, 1863. Other details of his early life are not known. However, according to one account, he was “one of the earliest employees of the Club, beginning shortly after its organization in 1881 as elevator boy.” Mechanical elevators were not unknown at this time, and it is possible that there was one leading to the second floor over Ross’ Grocery Store (present site of the Seelbach Hotel), which was the Club’s first home. It is also possible that he came to the Club shortly after it moved into its first clubhouse, the Belknap mansion, in 1883. It could not have been long [after this time] before the members noticed his dignity, his perfect manners, and his remarkable memory for names. It was a later tradition that Henry knew every man and woman in “Louisville society,” and that he was familiar with their pedigrees as well. . . .I can remember encountering Henry at the old clubhouse [the Belknap mansion] . . . when I was a child. His manner with our elders was impeccably correct[, and] . . . with the children of members, he was affability itself . . . He never patronized us, even when our hands were not scrupulously clean. No information survives as to when Mr. Bain officially became the Club’s Matri d’. He held this post for many years before his retirement. According to his obituary, “prominent men in Louisville and in many states and countries knew . . . and respected him.” Although he had been ill for four years, he was to have taken a “prominent part” in the dedication of the present clubhouse, which occurred in late 1928. However, his death on May 1, 1928 prevented him from doing so. Few individuals are still alive who actually knew Henry Bain, but his legacy lives on–in the fabulous sauce that bears his name and which has been enjoyed by generations of Club members. 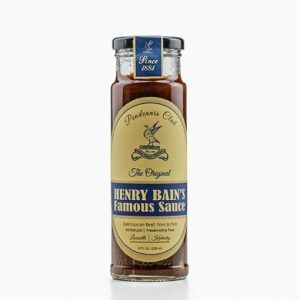 When served with virtually any meat or when included in a variety of other recipes, the original Henry Bain’s Famous Sauce will provide a distinctive taste unmatched by any other. Enjoy!